If you’re a follower of this blog or know me personally, you already know that I LOVE running! It’s a passion of mine and I’m always trying to get my family to love it as much as I do. I’m always trying to get my non-running friends and family involved in a local running event. I am especially partial to a few San Diego area races that are organized to give back to the community or donate proceeds to a noble charity. These are a few reasons why I fell in love with the Jr Hero Run and when I was contacted to promote the event, I was thrilled to be able to help in any way I can! 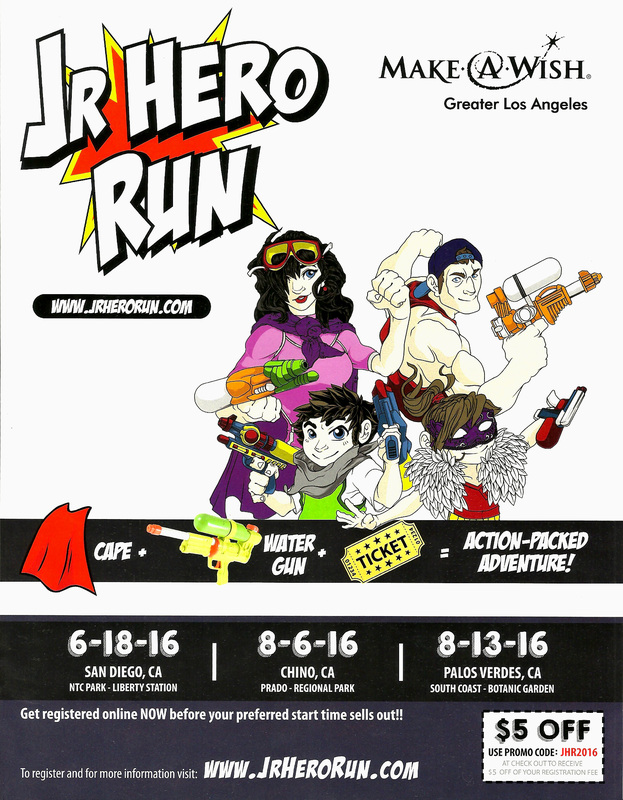 The Jr Hero Run is in its third year, this year. The mission of the Jr Hero Run is to raise money for the Make-A-Wish Foundation and to help them to grant more wishes. What a great cause! Can you imagine if we could grant the wish of every child? What a world! I love the Make-A-Wish Foundation for all they stand for, I love running, I love running with friends and family. Sign. Me. Up! The Jr Hero Run is where kids and adults dress up as their favorite superheros and fend off villains with water guns and be a real heroes for the day, as they navigate the 2-3k course. This is a lot more than just a run. As you make your way through the 2-3K course, you will need to courageously fend off villains with your water gun and recover a stolen coin from the villain fortress. Present the coin at the Hall of Justice and get awarded a finishing medal. How totally cool, right? I can’t wait to do this one! Grab your cape and come on out to the Jr Hero Run near you! More information about the Jr Hero Run can be found on the event website, Facebook, and Instagram. You can also enter the giveaway below or you can receive $5 off your race entry, simply by using the promo code: JHR2016 at check out. Which location would you like to run the Jr Hero Run? Have you ever run the race before? Disclaimer: I was offered race entries for my family, in exchange for promoting the event. Regardless, I love running and I love the Make-A-Wish Foundation and want the Jr Hero Run to be a success!